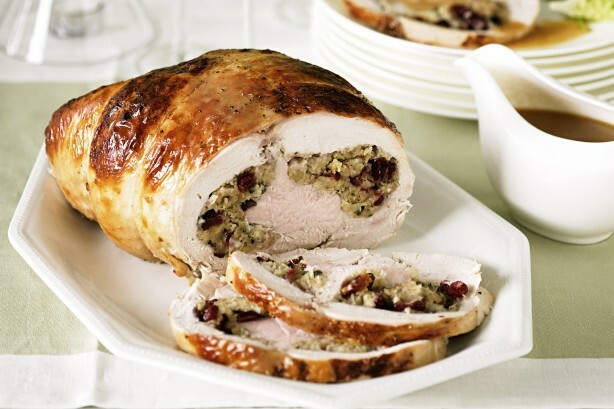 If the idea of roasting a whole turkey is not appealing to you, this recipe for brined and stuffed turkey breast roast is just the thing. No trussing or fancy carving needed. If you do ever decide to tackle a whole turkey, be sure to read my post How To Truss Poultry and How To Carve Poultry for step-by-step instructions. To make the brine, mix all the ingredients together in a large rectangular Tupperware or similar container with a lid until dissolved. Place the turkey in the brine and refrigerate overnight. Turn after a few hours. To make the stuffing, place the couscous in a large mixing bowl, pour over the stock, cover with cling film or a plate and set aside for 5 minutes. Place the dried fruit in a medium mixing bowl, add the tea and set aside to plump up. Loosen the couscous with a fork and add the well drained fruit as well as the nuts, lemon rind and juice, rosemary and seasoning. Add a little of the reserved liquid to moisten the couscous mixture. Remove the turkey breast from the brine and make a slit in the side to form a pocket (if using Turkey breast) or unroll the Turkey roll and spread the stuffing into the pocket and secure the opening with sosatie sticks or stainless steel skewers. Brush the skin generously with the oyster sauce. Place the turkey skin side down on a roasting tin and roast in a pre-heated oven at 200 ℃ for 20 minutes. Then turn the breast over and roast for another 25 minutes per 500 g of meat at 180 ℃. Remove the turkey from the oven and remove the sosatie sticks or stainless steel skewers. Transfer the turkey to a serving dish and keep warm until ready to serve. The turkey should rest for at least 20 minutes before carving. To make the gravy, stir the flour into the pan juices and add the hot water and wine. Add the salt, pepper and butter and stir continuously while bringing to the boil. Transfer to a sauceboat and keep warm. Serve the turkey hot, cold or a room temperature with the gravy. Trussing poultry is an important step in preparing it for oven-roasting. Trussing involves tying it snugly with twine so that the wings and legs stay close to the body. This makes it more compact which helps it cook evenly. Trussing poultry also helps prevent the tips of the wings and legs from burning, and makes the cooked poultry look more attractive when you serve it. This method is suitable for chicken or turkey. You will need: cotton butcher’s twine or string, someone to hold the twine (since your hands will be handling raw poultry), and something to cut the twine with. Cotton twine is strong enough to hold a turkey together but won’t burn, melt or otherwise ruin your roast. Cut a piece of twine long enough to encircle the whole turkey lengthways twice. Position the turkey breast-side-up with the legs facing you. Place the center of the twine directly beneath the tailbone of the turkey with the ends extending left and right. Lift the twine, loop each end around the legs and then reverse the twine to make a cross. Pull tightly on both ends of the twine so that the legs come together. Pull the ends of the twine forward (away from you), loop it around the front of the turkey and over the wings. Flip the turkey upside down so that the neck is now facing you, keeping the twine pulled tight. Tie a knot so that the twine stays secured underneath the neckbone. Trim any excess twine and flip the turkey onto its back again. Place the turkey on a roasting rack in a roasting tin and roast according to your favourite recipe. Remove the string when you are ready to carve the turkey. See step-by-step instructions on how to carve poultry here. 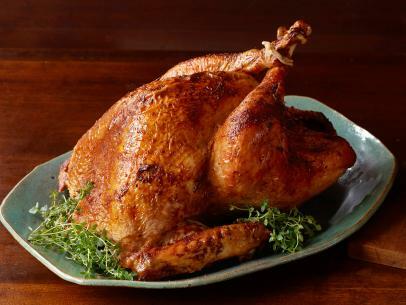 Be sure to check out the recipe for Marinated Turkey for an interesting take on the traditional oven-roasted turkey. Carving a turkey is just like carving an extra-large chicken. The same method can therefore be used for either. 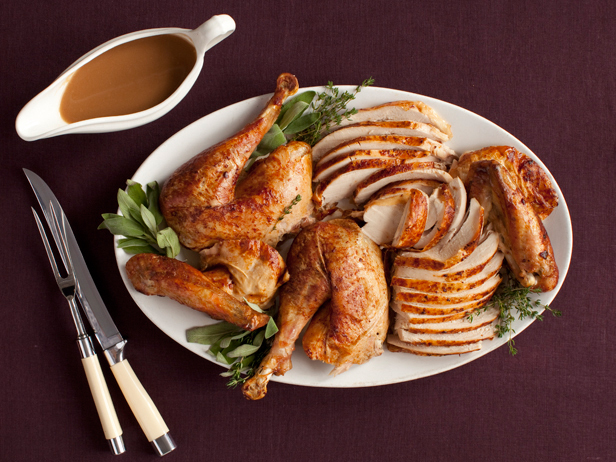 To carve poultry, use a very sharp carving knife and a fork or tongs. Cut through the skin that connects the breast and the drumstick. Slice down until you reach the joint. Grab the leg and push down, separating the leg and thigh from the bird. Use your knife to slice through the joint, i.e. where the bones join. Separate the drumstick and the thigh by cutting through the joint that connects them. Transfer the drumstick to a serving platter. Set aside the thigh meat on a cutting board to slice later. Do the same with the other leg. Remove the wishbone from the front end of the breast. Use your fingers to pull it out. Removing the wishbone makes it easier to carve off the breast meat. Find the breastbone. Position a long, flexible knife (or a boning knife) on one side of it, and slice downward, as close to the bone as possible. As you slice, use your other hand to pull the meat away from the breastbone, until you’ve cut the breast off the carcass in one piece. Transfer the breast to the chopping board. Remove both of the wings from the carcass. Remove the meat from the thigh and transfer the thigh meat to the platter. Slice the breast meat against the grain and transfer it to the platter. Set aside to cool, cover and refrigerate until ready to plate or reheat. This fragrant baked chicken dish can easily be turned into a one-dish meal by adding vegetables such as quartered onions, green beans, baby marrow, etc. to it. Preheat the oven to 180°C and grease a large oven roasting tin. Place the chicken pieces in a single layer in the roasting tin. Brush the skin-side of the chicken pieces with butter or coconut oil. Season the chicken pieces on both sides with the salt and sumac. Cover the roasting tin with foil, place the roasting tin in the oven and roast for 45 minutes. Remove the roasting dish from the oven and add the tomatoes and cream if used. Return the dish to the oven uncovered and increase the temperature to 200°C to crisp up the skin. Meanwhile, melt the butter or coconut oil in a saucepan and add the babymarrow spaghetti. Stir-fry until cooked. Season with salt and freshly ground black pepper. To serve, spoon the babymarrow spaghetti onto a large serving platter and top with the chicken pieces. Alternatively, spoon the babymarrow spaghetti onto individual plates and top with the chicken. 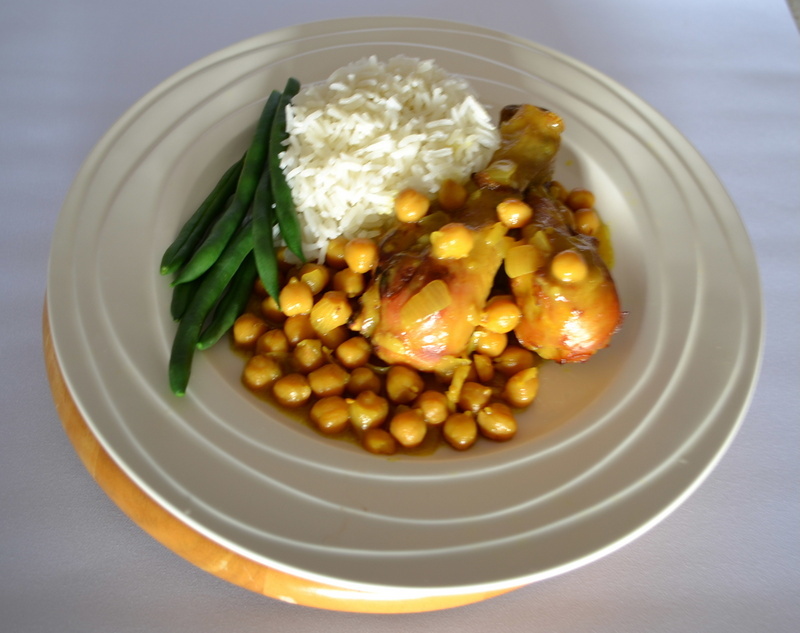 This is an easy-to-assemble chicken dish which tastes terrific and is well complemented by the texture of couscous. Heat the oil in a large saucepan that can also be used in the oven. Add the chicken, onion, garlic and turmeric and sauté over moderate heat, stirring from time to time, until golden all over and slightly browned. Add all the remaining ingredients, stir to combine, cover and cook at 180ºC for 1.5 to 2 hours or until the meat is quite tender. Adjust the seasoning and if necessary, to thicken the pan juices, add a little cake flour mixed with water and boil for 2 minutes. Transfer to a suitable serving dish and keep warm until read to serve. 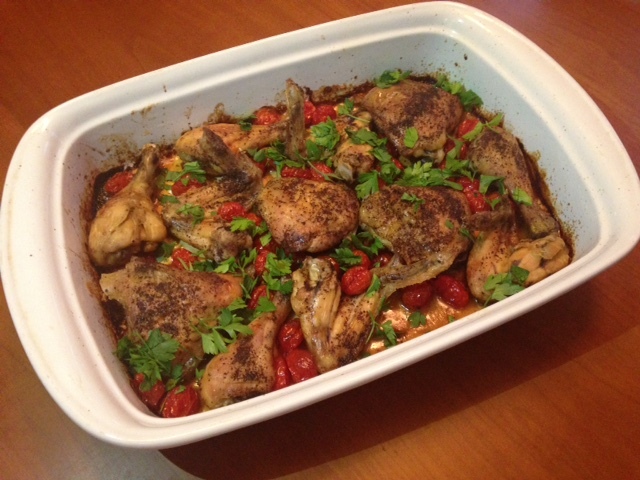 Serve with couscous and vegetables. To make the couscous, place the couscous in a bowl and add the boiling water and salt. Stir to mix well. Allow to stand for 5 minutes until the water has been absorbed. Add the oil and fluff the grains with a fork while mixing to get rid of any lumps. Add the butter and microwave on HIGH for 1 minute so that the butter can melt. The chickpeas can be replaced with any canned beans, e.g. cannellini, borlotti, etc. 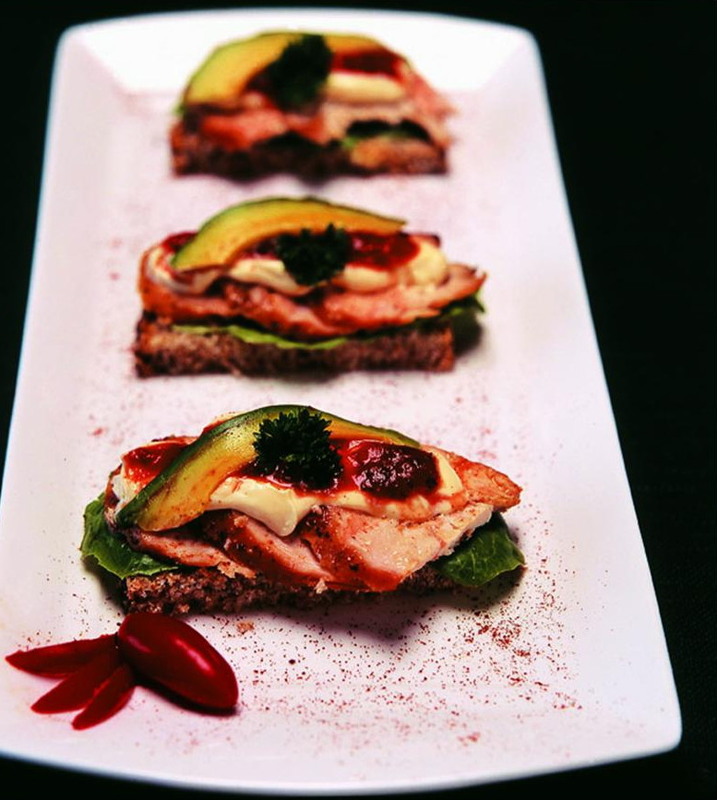 Recipe by Carolié de Koster from the Art Of Cooking Recipe Book p. 310. These chicken rolls are quite labour-intensive to make, but worth the effort once the compliments start coming in! To prepare the stuffing, heat the oil a large saucepan. Heat the oil in a large saucepan. Add the onion and stir-fry with a turner for a few minutes until tender. Add the sugar if used, and continue to stir-fry until the onions are caramelised. Set the onion aside to cool. Snip the chives into 2 mm pieces and add it to the bowl with the onion. Add the cheese to the and mix well. Set it aside. Cut 6 pieces of foil (20 x 30 cm) and lay the pieces of foil out next to each other on a work surface. Brush a little oil onto the middle of each of the pieces of foil. Remove the bacon from the packaging and transfer the bacon to a large plate. Place two to three strips of bacon (it should be about 10 cm wide and 20 cm long) on each of the pieces of foil so that the bacon overlaps a little. Set it aside. Tear a piece of cling wrap the size of an A4 page from the roll and place it on a chopping board. Tear a second piece of cling wrap from the roll and set it aside. Remove the chicken breasts from the packaging and transfer them to a the plate used for the bacon. Work with one chicken breast at a time and place it on the piece of cling wrap on the chopping board (pictured below). Flatten it into a rectangular shape with a rolling pin. Remove the chicken breast from the chopping board with a turner and place it on top of the bacon strips. Do the same with the rest of the chicken breasts. Season all the chicken breasts with salt and freshly ground black pepper. Divide the stuffing into six equal portions and place it on the chicken breasts. Work with one chicken breast at a time and roll it up tightly to enclose the filling (pictured below). Wrap the chicken breast roll in the foil like a cracker (pictured below). Do the same with the rest of the filling and chicken breasts. Place the chicken rolls in a steaming basket in a large saucepan (pictured below) or use an electric steamer and steam the parcels for 20 minutes. Remove the rolls from the saucepan or steamer with tongs and set them aside to cool for a few minutes. Unwrap each parcel while holding it over a mixing bowl in order to catch all the juices. Transfer the chicken rolls to a chopping board and set it aside. Discard the foil. Heat the oil a large saucepan. Place the saucepan on the stove and switch the stove on to heat the oil. When the oil is hot, transfer the chicken rolls to the pan and brown them on all sides. Transfer the chicken rolls to a serving dish and set it aside to cool. To make the gravy, transfer the reserved juices to the saucepan and add the stock powder and cream. Bring the mixture to the boil while stirring or until the sauce has thickened. Season to taste and transfer the sauce to a gravy boat. 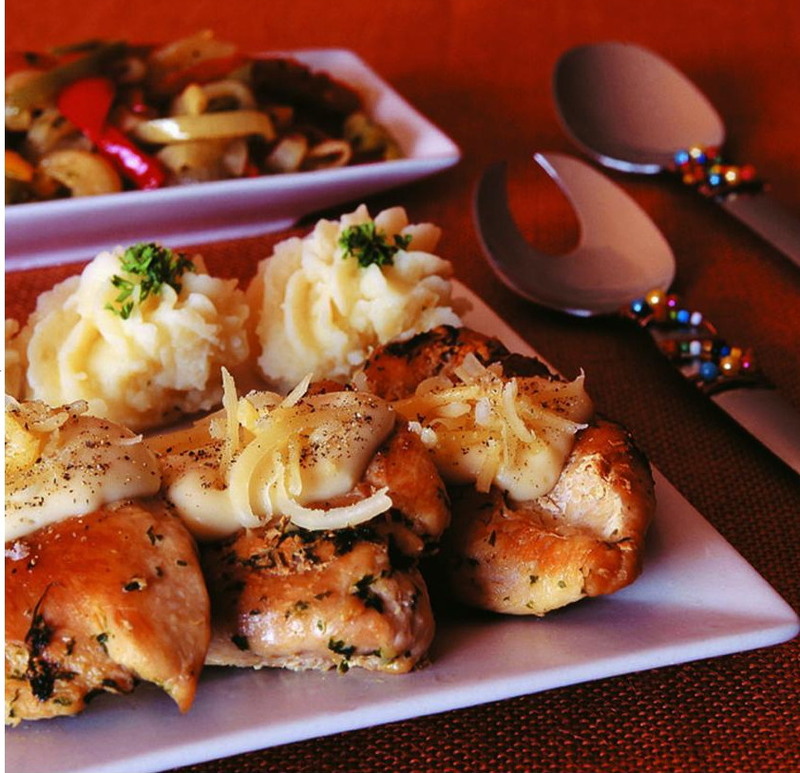 Reheat the chicken in an oven preheated to 160 º C covered with a lid or foil. 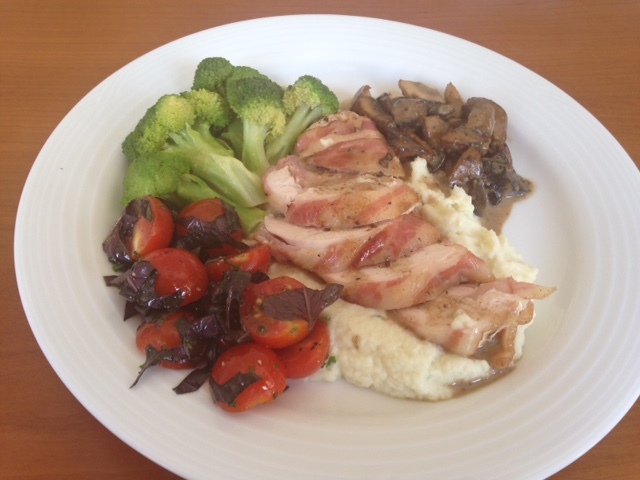 Serve the chicken with the warmed sauce on a bed of parslied cauliflower mash with colourful vegetables such as steamed steamed broccoli and tomato and red basil salsa (pictured below). The recipe can easily be adapted to the amount of servings required. The chicken needs to marinate overnight, so start this recipe a day in advance. 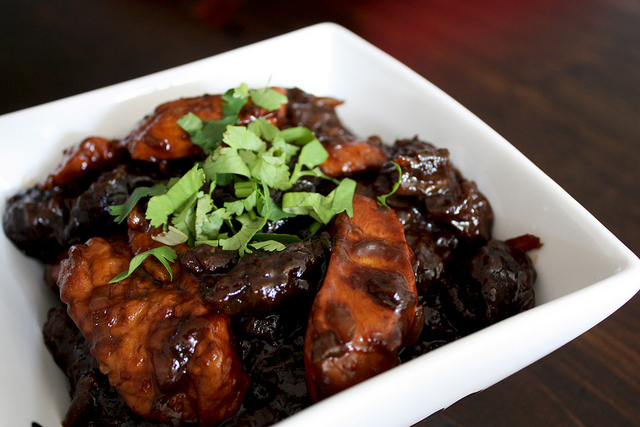 The end result will be chicken that is tender and flavorful. You won’t be disappointed! Combine the buttermilk, garlic, hot sauce, if used, salt, pepper and paprika in a large bowl and stir until evenly combined. Pat the chicken dry with paper towels and transfer it to a 20 x 30 cm ovenproof dish. Pour the buttermilk mixture over the chicken, cover with cling wrap and refrigerate for 12 hours, turning once. Fit a wire rack inside a roasting pan and set it aside. Place the crumbs in a shallow dish and season generously with salt and pepper. 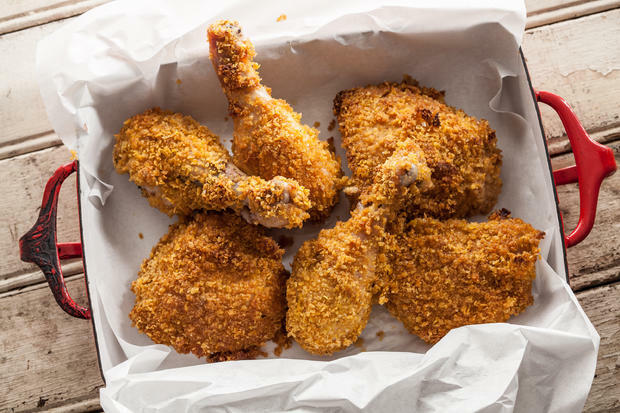 Remove a piece of chicken from the buttermilk marinade, letting the excess drip off, and place it in the crumbs, turning to coat completely and pressing the crumbs onto the chicken to adhere. Set the chicken aside on a cutting board and repeat with the remaining pieces of chicken. Transfer the chicken pieces to the rack in the roasting pan and bake until golden and crispy – about 35 minutes. Substitute the chicken pieces for skinless & boneless chicken breasts and cut them into strips before adding them to the marinade. The cooking time will be about 20 minutes. These bites will disappear in an instant. It also tastes great as leftovers. Combine the canola oil, lime juice and Tobasco or Sriracha sauce in a large Ziplock bag. Cut the chicken into bite-sized pieces and add it to the bag. Once all of the chicken pieces are in the bag, turn the bag to coat the chicken with the marinade and place in the fridge for about 1 hour, turning after half an hour. 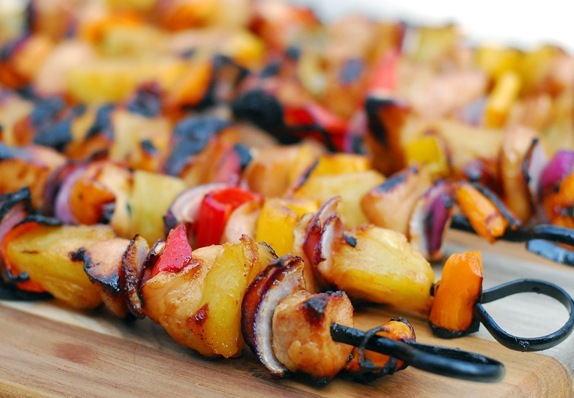 Soak toothpicks in hot water to prevent them from catching fire if you plan to grill the bites in the oven. Cut each slice of bacon into two or three pieces (it must be big enough to wrap around the chicken pieces). Wrap the bacon around each piece of chicken and secure with a wooden toothpick. Brush the bacon with a little olive oil before coating it with brown sugar. Braai on a medium-high heat for about 10 minutes or until the chicken is cooked and the bacon is crispy. Alternatively, pre-heat the grill and grill the bacon bites on a roasting pan about 10 cm from the grilling element. 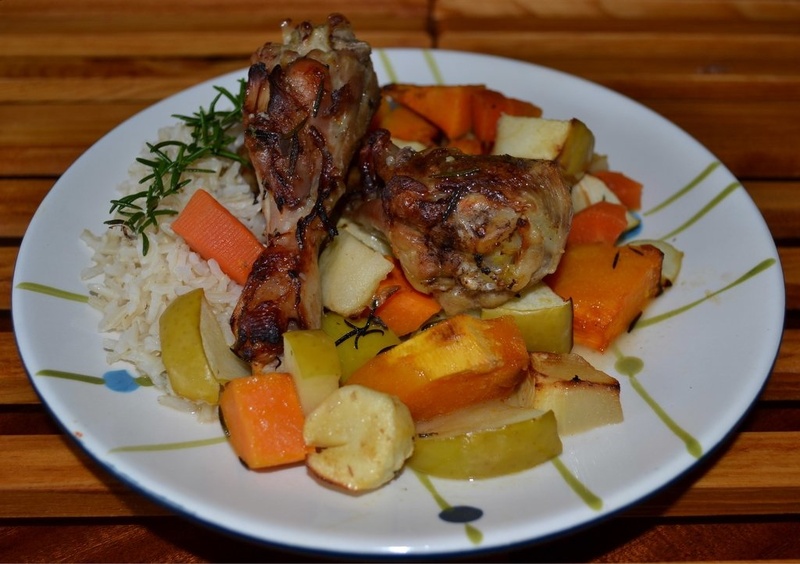 A colourful and flavourful all in one main course dish served with a bowl of fluffy white rice. 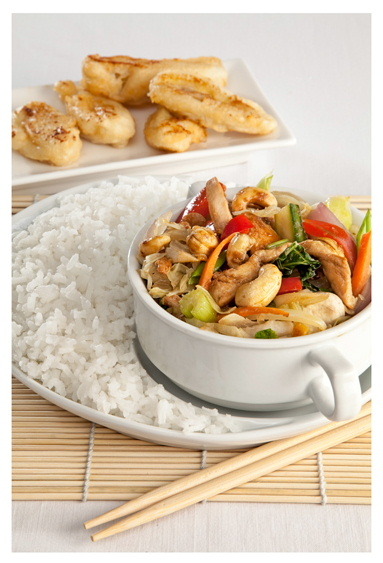 The ingredients can be prepared in advance and kept sealed and refrigerated for several hours, but stir-fry and complete shortly before serving. Place the rice into a saucepan, cover with water, allow to stand a few minutes, stir well and drain off the water. Add the salt and water and bring to boil. Boil rapidly for 5 minutes, reduce heat, cover partly and cook very gently for 20 minutes or until the rice is almost dry. Cover completely and allow to steam until ready to serve. Fluff lightly with a fork, turn into a warmed bowl and keep warm. Flatten the chicken breast with a mallet and cut in diagonal strips. Mix the salt, cornflour and stock powder and toss the chicken strips onto the mixture. Heat the oil to quite hot and stir-fry the meat for 5 minutes. Add all the remaining ingredients for the first saucepan, stir to combine and cook uncovered over moderate heat for 5 minutes more. Heat the oil for the second saucepan and add the onion, leek, garlic and ginger. Stir-fry 3 minutes and add the carrot and celery. Stir-fry 3 minutes more. Add all the remaining ingredients for the second saucepan and stir-fry 3 minutes more. Combine the ingredients of the two saucepans, adjust seasoning, adding a little extra soy sauce if preferred and toss in the snipped spring onion. Turn out into a warmed serving dish and serve with the bowl of rice. A trendy and tasty one dish meal which will not only please family and friends but is also most manageable to make when food is needed for a large group. Remove the skin from the chicken portions and place into a saucepan with the stock or water and stock powder. Bring to boil, reduce heat and simmer 15 minutes while preparing the vegetables. Combine the ingredients for the basting sauce. Place the vegetables, rosemary and basting sauce into and oven roasting pan. Toss well and arrange evenly in the pan. Place the chicken portions between the vegetables and turn over to coat all over with the basting sauce. Drizzle any leftover stock from the pan used to cook the chicken over the vegetables and meat and bake uncovered at 180ºC for 20 minutes. Toss in the apple and bake about 20 minutes more or until the vegetables are cooked to taste and attractively browned. When almost ready to serve, place the beans in a saucepan, add enough water to cover and boil quickly and uncovered for about 5 minutes until just tender. Spoon the meat and vegetables into a serving dish and garnish with the drained beans and a good grinding of pepper. “Spatchcock” (poussin in French) is also the traditional word for a juvenile chicken. Spatchcocks were generally butterflied during preparation to speed up the cooking time. The word therefore refers to both the bird and the manner in which it was traditionally prepared. Spatchcocking yields a perfect roasted chicken that will cook 15 minutes faster than a whole chicken. It also exposes more skin, which crisps up nicely. Prepare a braai for indirect cooking. To butterfly the chicken, lay the chicken breast side down on a chopping board with the tail end facing you. Use poultry shears (kitchen scissors will also do!) to cut out the back bone. Do this by cutting through the ribs to the left of the backbone. Also cut to the right of the backbone and remove the backbone and the tail. Remove the breast bone next by cutting it loose with a utility knife. Rub olive oil into the chicken on all sides. Season the chicken with salt and pepper or spices of your choice such as garlic and herb seasoning. Place the chicken breast side down on the rack of the Weber over a drip pan . Tuck the wings in and cook covered with the vent open until nicely browned – 10 to 15 minutes. Turn the chicken over and cook for a further 30 minutes or until the internal temperature of the meat reaches 75 degrees celcius in the thickest part of the thigh. Check to see whether it’s cooked by inserting a meat thermometer or by placing a skewer in the thicker part of the leg.The juices should run clear, i.e. not look pink. Transfer the chicken to a carving board and let it rest 10 minutes. Cut the chicken into 8 pieces and transfer to a serving dish.